The Libyan navy said on Saturday that it rescued a crew of 14 members on a cargo ship that drifted off Tripoli’s port on Wednesday because of high waves and bad weather. Somalia security forces have rescued an Indian cargo ship which was hijacked by Somali pirates on April 1 but nine members of the 11-crew are missing, a regional maritime official said on Tuesday. John Steed, the regional manager of not for profit group, Oceans Beyond Piracy said the hostages are believed to be being held between the vicinity of Hobyo and Haradhere in central Somalia. “The Indian ship was released by Somalia security forces on Monday night but nine of the 11 crew members are missing having been taken ashore by the pirates. The vessel is sailing away,” Steed told Xinhua by telephone. The pirating of the Indian dhow came after the fuel tanker, Aris 13, was held for four days by armed pirates. The Indian ship, Al Kausar was one of three foreign vessels to be hijacked after a five-year lull. “We haven’t established where the hostages were taken,” said Steed, noting that Somali pirates are holding 17 hostages from Iran and India. “The pirates are holding 17 hostages at the moment. Eight are Iranians while 9 are Indians,” Steed said, adding that efforts are underway to secure their release. Al Kausar was chartered by a Somali businessman and was carrying commercial goods. The vessel which was en route from Dubai, the United Arab Emirates (UAE) to Bosasso in Somalia was hijacked in the vicinity of Socotra (Island). The release of the Indian vessel comes after sailors from Indian and Chinese Navies on Sunday freed a Tuvalu-registered vessel which had been boarded by pirates. The vessel had 19 crew members. Somali pirates tend to be well armed with automatic weapons and rocket propelled grenade (RPG) and sometimes use skiffs launched from mother vessels, which may be hijacked fishing vessels or dhows, to conduct attacks far from the Somali coast. Maritime experts said lack of economic opportunities and the prevalence of illegal fishing are pushing more Somalis to turn to piracy — partly as a form of protest and partly because they see no other options. Quoting Assistant Secretary Gary Domingo of the United Nations and Other International Organizations (UNIO) office of the Philippine Department of Foreign Affairs (DFA), he said that in asset freeze, the Philippine Coast Guard has to impound the ship. “That means, the crew must be eventually deported,” he said, noting that a UN team might come to the country to inspect the ship. 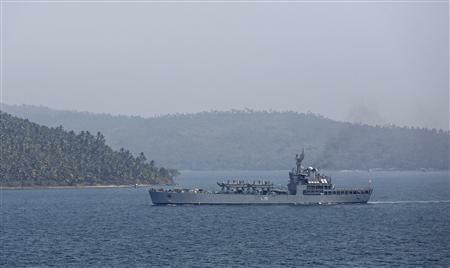 Quezon said the Philippines will also send a report to the UN on the actions it has taken with regard to the vessel, which has 21 crew members from DPRK. A container carrying the twenty-four foot Brazilian built ocean rowboat, Spirit of Malabo, left the Port of Cap Haitian on Saturday en-route to Port Everglades Terminals (PET) in Florida aboard Antillean Marine Shipping Corporation vessel RUMBA. The oarsman, Victor Mooney of Queens, New York who successfully crossed the Atlantic Ocean last year from the Canary Islands to Saint Martin, French West Indies in one-hundred and twenty-nine days, was robbed off the coast of Haiti and had to stop his row. Mr. Mooney?s row was in honor of his brother who died of AIDS in 1983 and to encourage voluntary HIV testing. Mr. Mooney tried the Atlantic Ocean crossing three times over a ten year period without success. When the container arrives in Florida, the boat will be transported on land to Spencer Boat Company for service. After the boat is structurally repaired and tested, Mr. Mooney will continue the final 1,500 mile row to New York?s Brooklyn Bridge. 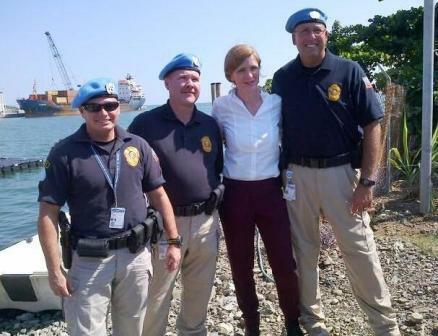 The United States Permanent Representative to the United Nations, Ambassador Samantha Power also witnessed Antillean Marine Shipping Corporation vessel RUMBA in the port as well. Ambassador Power was part a United Nations Security Council Delegation visiting Haiti over the weekend. Antillean Marine Shipping Corp., a family-owned and operated company has been a major marine company since 1963. Antillean Marine operates from Port Everglades Terminals (PET) with regular liner service to ports in Haiti and the Dominican Republic and Panama. Antillean Marine Shipping Corporation team of well-trained professionals has full knowledge of their market. They are dedicated to ensuring that your cargo, whether a large or small, reaches its destination safely and on schedule. Backed by State-of-the-Art computerized tracking and communication systems, modern ships, facilities and equipment, they get the job done.